In several modern technological applications, the formability of functional metal components is often limited by the occurrence of localized necking. To retard the onset of such undesirable plastic instabilities and, hence, to improve formability, elastomer substrates are sometimes adhered to these metal components. 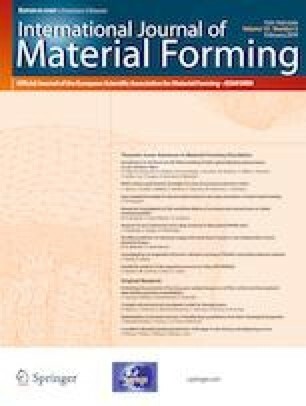 The current paper aims to numerically investigate the impact of such elastomer substrates on the formability enhancement of the resulting bilayer. To this end, both the bifurcation theory and the initial imperfection approach are used to predict the inception of localized necking in substrate-supported metal layers. The full-constraint Taylor scale-transition scheme is used to derive the mechanical behavior of a representative volume element of the metal layer from the behavior of its microscopic constituents (the single crystals). The mechanical behavior of the elastomer substrate follows the neo-Hookean hyperelastic model. The adherence between the two layers is assumed to be perfect. Through numerical simulations, it is shown that bonding an elastomer layer to a metal layer allows significant enhancement in formability, especially in the negative range of strain paths. These results highlight the benefits of adding elastomer substrates to thin metal components in several technological applications. Also, it is shown that the limit strains predicted by the initial imperfection approach tend towards the bifurcation predictions as the size of the geometric imperfection in the metal layer reduces.